Target is by far one of my favorite places to shop regularly. It is definitely one of those one stop shops, actually it is THE one stop shop. I hardly ever leave without spending $100 and if I leave spending $50 that is a win for me. 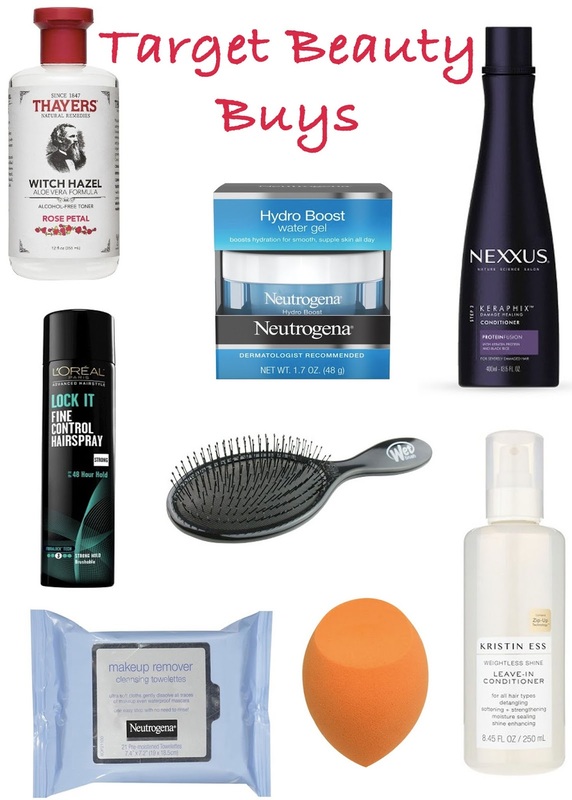 Today I am sharing my favorite Target beauty buys, the ones you can always find at my house. And if you don't live in the US and don't have a Target locally, all of these items can be found on Amazon. This toner is my favorite toner of all time. And my husband's too! Yes, K, surprisingly told me the other day that he was using it in the morning and I had no idea! He uses it after shaving because it instantly heals any irritation or redness. I was using it first thing every morning, instead of washing my face (remember this post), but I have since changed my morning routine because of dryness and use it on those mornings when I feel a little extra build up from my nighttime serums and moisturizer. It is such a great toner to have around when you need it, it smells great and is all natural. I cannot say enough good things about this moisturizer, just try it. It is dermatologist recommended and I like it better than La Mer's holy grail $100 moisturizer. This conditioner has delivered healing to my hair. I have less tangles and breakage, my hair is smooth and soft. Since making the switch to this conditioner my hair feels looks healthier, is thicker and more manageable. With other conditioners I was getting out of the shower with knots still in my thin hair. With this conditioner I don't struggle with knots which makes my hair break less allowing it to grow. Lately I am curling my hair, mainly for shooting photos for this blog but also for date nights with K. I grabbed this hairspray after my friends told me it was her favorite drugstore hairspray. It holds so well without being sticking or crunchy and I can still get a brush through it. I don't think I'll ever have a reason to switch because it does the job and is so cheap! If you are like me and deal with tangles and knots this brush is a must. Instead of pulling through my tangled hair several times I am able to untangle my hair with one swipe of this brush. I try not to brush my wet hair too much because that is when hair often breaks and this brush helps keep brushing to a minimum. The bristles are very thin and designed to easily move through tangled hair. I don't use it to blow dry or style my hair but just to detangle it. My bedside babies. I have tried several other makeup removing wipes (I won't name names) but none are as efficient in cleansing but also skin smoothing as these. I also never travel without these wipes. On vacation I am always too lazy to wash my face at night and they keep me from sleeping in my makeup. And to be honest I use these wipes on a regular basis because I don't wear a lot of makeup and my skin does not need to be deep cleaned every night. Instead it only needs the impurities of every day removed from it's surface. For example; today I didn't wear makeup at all, so using this wipe tonight instead of washing is ok in my book. It removes dead skin cells like washing does but doesn't strip my skin of it's natural oils. Tomorrow I will definitely wash my face, because two days of not washing it would be kinda gross, even if I don't wear makeup again. Most likely I will wash my face in the shower using this charcoal cleanser to exfoliate as I do every couple of days (see this blogpost). Bonus my charcoal cleanser is another Target beauty buy! I was EXTREMELY skeptical about these beauty sponges at first. I did not understand the hype. I have always used my fingers to apply my makeup and did not see the reason for a sponge. Fast forward to me buying this sponge... mind blown! The ability to dab makeup on has taken on a whole new meaning and I think that the blending process is much more seem less. The angles of this sponge are my favorite because the pointed tip perfectly blends concealer into the corners of my eyes and the flat end blends foundation, cc creams, bronzer and etc into my cheeks, jawline and forehead. This spray leave-in conditioner makes my hair soft and SHINY without leaving behind a residue or weighing my hair down. I spritz my hair with it about ten times after I wash and condition my it. I focus on my ends and stay away from my roots to maintain my volume. Sometimes I forget to use it and I always regret those days because the shine it adds is a noticeable difference. Hello, I'm Sharon, a wife, dog mommy, wine lover, traveler and wonderer of all things fun, pretty and interesting. I'd like to think of my view as realistic with a bit of whismy.